It has been over a week since we discovered that Carmen Reinhart and Kenneth Rogoff made some unusual modeling choices and an error in key calculations in their seminal paper Growth in a Time of Debt. I’ve spent plenty of time working on financial models in Excel. In fact, I helped write a book about it. And yes, before you ask, there are (a small number of) errors in the book. My co-author keeps a list of errata for all of his books accessible online, so feel free to check it out and make fun. However, I now work primarily in R and Python, using each both accounting/forecasting purposes (as well as a bunch of other things, of course). I’ve even worked with SAS on one painful occasion. So I have at least a little perspective to opine on Excel and alternatives. 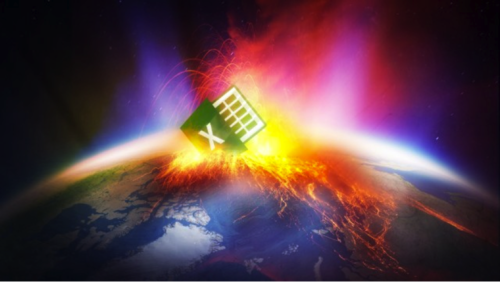 First, let me say that Excel, as a piece of software, is not the culprit here. My nerd cred be damned, finding the average of a small data set like this is as appropriate a use for Excel as you’re going to find, especially where the data may be updated asynchronously from multiple different sources by hand, and new rows may need to be added piecemeal. Plus, it’s not like other approaches to data work are error-free. Excel has parts that I hate (type errors, propagating rounding, MERGED CELLS… the horror…) but mis-identifying your sum ranges is more sloppiness than anything. I do appreciate Cathy O’Neil’s commentary on the situation, especially her call that this information should be openly available. And I think that’s a reasonable in an academic setting. Much like Paul Graham’s view that death is the default for startups, I think errors are the default for analysis. It takes a fair bit of effort to make sure that analysis is done right, and generally the best way to do that is to have lots of eyes on the process. And Excel’s biggest drawback is that it doesn’t make it easy for non-authors to see the process. Is this cleaner? Yes. Can I see the calculations? Sure! But what do I know about the data here? What’s in front of me most of the time is my code. I would call this ‘function-oriented’ (even though my pseudo-code isn’t ‘functional’ in the least). I certainly can view the state of the data in R, just like I can see the functionality in Excel by opening the editor or clicking on a cell, but that’s not playing to each approach’s strength. I try to be conscious of this difference when I’m working on analysis projects. In general, the less good I feel about my data, the more likely I am to spend time in Excel. I feel closer to the numbers in that program. On the other hand, if I am more concerned about the steps I’m taking in the analysis, I’ll use R or Python to iterate through different types of analysis and evaluate what’s working and where my errors are. 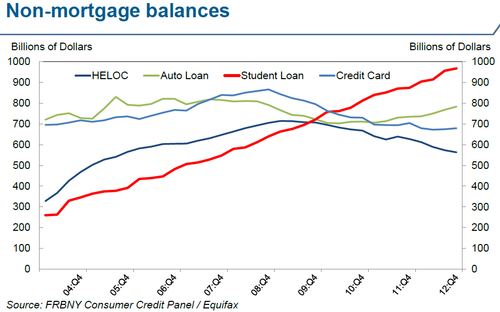 Today I learned that student loans recently surpassed credit-cards to become the largest non-mortgage source of debt for US consumers. 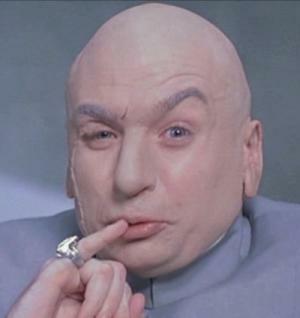 Not only that, in the next quarter or two, total outstanding debt will ominously hit 1 Trillion Dollars. The remarkable thing about this is not just how big student loan debt is, but how much it has grown in the last few years. 1- while the other types of debt seem to be cyclical, student loan balances seem to have climbed at a pretty steady pace, in good times and bad. 2- in 8 years, student loans have almost quadrupled in size! 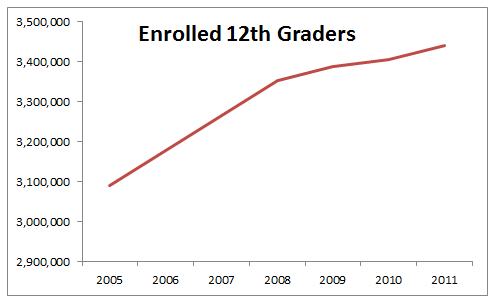 Obviously, some part of this is demographic: there have been more kids graduating as the ‘millenials’ grow up. But the change has been about 11% over the past 7 years. The NY Fed has a helpful page on this as well. - over $3,000 per person in the US. - larger than the entire construction industry’s impact on US GDP. To be fair, I think much (certainly not all) student debt is warranted. Though being a lawyer isn’t what it once was, and there are smart people calling education a bubble, I know I got a lot out of university and I imagine most other people who went did as well. Recently I took a look at the Wikipedia page for Nielsen ratings and noticed that they list out the most popular show for each year. 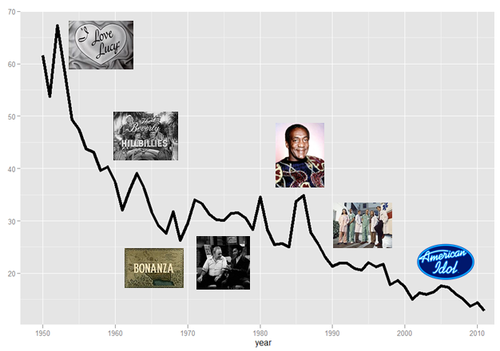 The most popular show is getting less and less popular every year. The top-rated show last year, Monday Night Football, had a rating of 12.9, which according to Nielsen means that 12.9% of US TV households watched, on average. The top rated show 28 years before, Dallas, had a rating of more than twice that, at 25.7. 28 years before that, I Love Lucy had a rating of about 50 (and an all-time high over 60 two years before that). It looks like the Nielsen ratings of the top US show are roughly following an exponential decay curve. 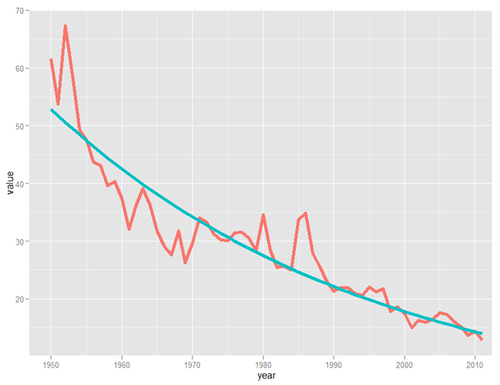 I did a quick fit using the nls function in R.
This gets a bit of a statistics caveat* but overall I feel like this is a pretty good sense of how ratings are trending. Based on the trend, by 2029, no show will earn a 10 rating, though frankly that might happen sooner. And if you really want to stretch the limit of time (and credibility) by 2100, no show will be watched by more than 2% of TV-watching households. 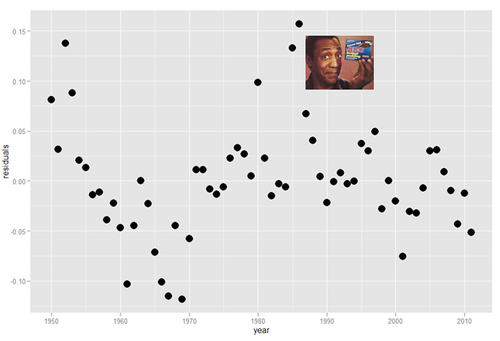 So there you have it: The Cosby Show is the show that exceeded its era in ratings more than any other. It is the greatest ratings champion of all. 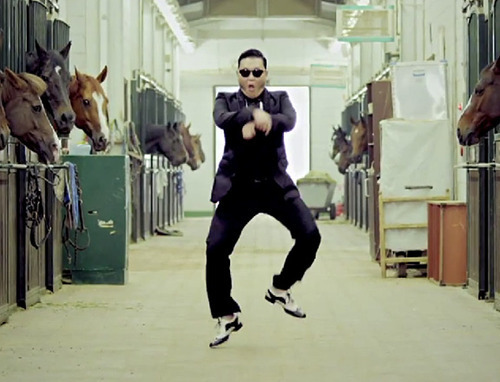 More seriously, I’m writing this a couple of days after Gangnam Style became the first YouTube video to hit 1 billion views. Granted, I work for a (great) tech company, but I think for a large portion of us, we’re more likely to talk about cultural events that we experience them through the internet than through TV. When I think of cultural events that I personally experience through media, I think of the Super Bowl and paradigm-shifting news events. I remember being pulled out of class to watch the OJ verdict on TV in grade school. But now more of our shared political and cultural events are experienced together online. I didn’t turn on the TV when I found out bin Laden was dead, and I watched the Pacquiao-Marquez highlights online as well. At the same time, segmented, niche communities are forming around TV shows. While shows are easy, it takes a larger mental investment now for me to DVR a program and keep up with it than it does to see the new thing online, since we’re so inundated with information. Watching a show live will be a source of pride and almost a status symbol in certain circles, like knowing a band before everyone else or getting a short username on twitter (disclosure- I work on loyalty programs. Sometimes for television programs). I think the future of TV will look more like the web used to look- tighter niche interest focus and more interactivity, while the internet will serve more and more of the traditional roles of TV and major sites will continue to broaden focus. *The first thing that jumps out at me here is that the set is auto-correlated (DW=.69). That’s a function of shows lasting more than one year, so the data isn’t truely iid anyways. I actually looked at residuals based on an autoregressive model, but it typically penalized shows that were popular for multiple years, which didn’t seem like a great way to determine the most popular show, IMHO. Anyways, I figured the gist of this is probably enough- TV shows aren’t reaching the wide audience they once were. 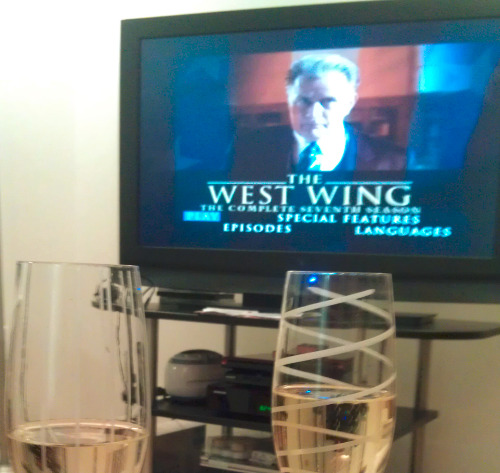 Tonight, Christmas 2012, my fiancé and I finished watching The West Wing for the first time, more than 20 months after we watched the first episode together. We watched every episode together. 7 seasons. 156 episodes. Including a couple of double episodes, that’s 6,715 minutes of TV. 112 hours, or almost 5 days straight. We started watching when my fiancé and I celebrated Passover together in April 2011. I proposed to her after we watched one episode and before we watched another. And we are finishing almost exactly a month before we get married. I feel silly saying it, but I’m really proud that we watched ever minute together. It has been a constant in our relationship and a joy that I have looked forward to for many weeks. And yes, for the record, I would recommend the show. Last night, the San Francisco Giants won the World Series, sweeping the Detroit Tigers. Despite an awesome playoffs, ratings were way down this year. A big part of that is due to smaller market teams getting further in the playoffs, but I feel like the US is becoming more football-oriented each year. To investigate, I looked at Nielsen ratings for the 4 major sports championship (NBA Finals, Stanley Cup, Super Bowl, and World Series) over the last 25+ years (less for hockey). 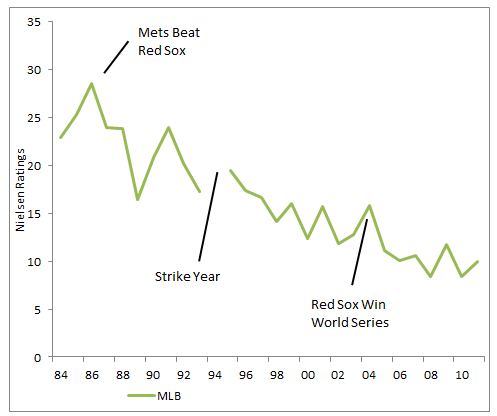 MLB, on the other hand, has seen a steady loss of ratings since the mid-80s. The average World Series game rating is about half what it was when this happened. 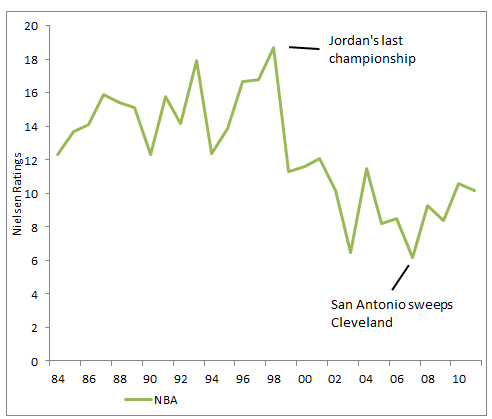 The NBA has also seen sliding interest, with a huge fall-off in viewership after the Michael Jordan Bulls broke up. It does seem like interest is picking back up though. 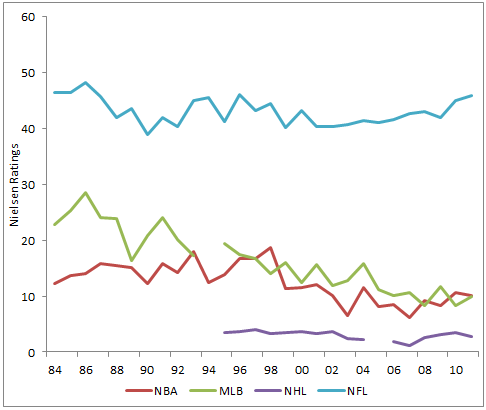 Here is the chart of all four sports. Sorry hockey- I don’t know enough about you to write anything interesting. You can see the Super Bowl has always been more of an ‘event’ than the other sports finals. 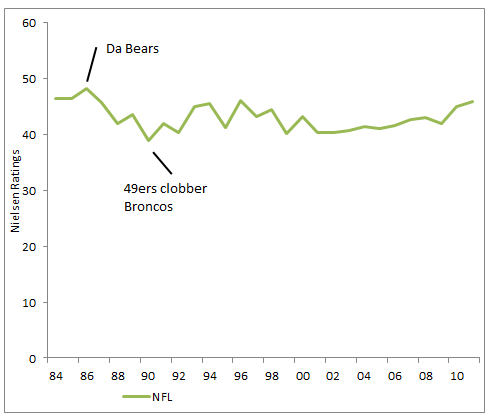 But even taking that into account, it is clear: we’re becoming more of a football country. 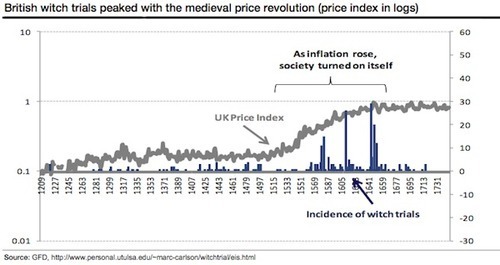 1% inflation —-> witch hunts. It’s a shame too. Politics has some of the best data and forecasting around. And great gossip and news. Every four years I take a look at the election and wish I could get as excited as my friends. 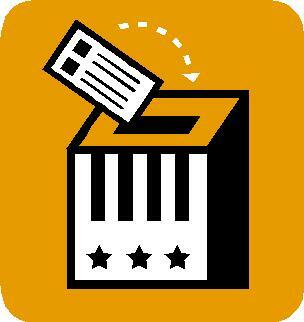 Through Lumesis, I had to follow elections and politics more closely, since it impacted our business. Now at CrowdTwist, I don’t interact with politics as much, but it still rears its ugly mug occasionally. Predictive models, on the other hand, I can get into. And boy, are there a lot of them! Most of my friends love politics but have no interest in digging through political papers. So for all of you: here’s a cheat sheet for who is calling which candidate, why, whether it measures popular or electoral votes, and how seriously I take them. Who is this guy? : Professor atThe American University in Washington, D.C.
Mudslinging: Nate Silver at 538 has a teardown. How does it work? : Lichtman asks 13 ‘True/False’ questions (like ‘is the incumbent-party candidate charismatic?’). It’s best-of-13: if 7 are true, incumbent wins. If not, he loses. That’s it. Best thing about it: uh, it’s hilarious that anyone takes this seriously? My thoughts: This gets press? Let’s move on. Mudslinging: In 2008, Abramowirz donated the Obama and didn’t disclose it, according to Wikipedia. My thoughts: For what it’s worth, Abramowitz’s model seems hacked together. It’s no ‘keys’, but I consider its predictive power to be suspect. How does it work? : The model is a best fit regression that takes into account a few non economic variables (are we at war? Is a sitting president running? 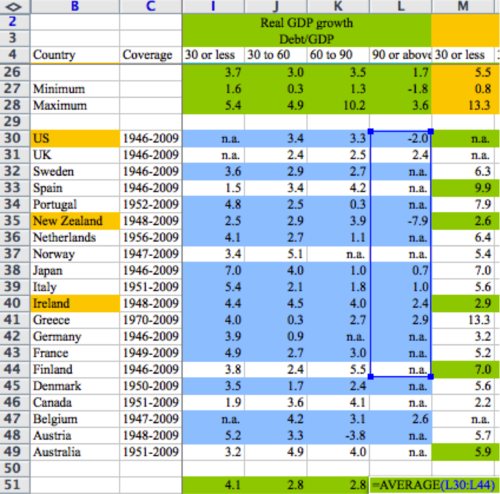 etc) and adds in GDP growth, inflation, and the number of quarters of strong economic growth during the administration. Strong, consistent growth is good for the Prez. Big claim: Fair claims his model has been right 21 or 22 times in the last 24 elections (that’s starting in 1916 for the English majors) depending on how you classify Bush-Gore. It missed badly with Bush-Clinton in 1992 and he counts 2000 as a miss too. Worst thing: Fair calculates his model’s standard error at 3%, so the model doesn’t really tell us anything. Any it hasn’t worked well in recent elections. But other than not making a decision and then often being wrong when it does, it’s a pretty sweet model. My thoughts: I am something of a Prof Fair fanboy- I really admire his work around aging in Sports and Chess. His election model is classic econo-physics: elegant and reasonable, but ultimately limited. Big claim: Hibbs doesn’t make huge claims: I have seen others say he claims 90% of variability in his model but I haven’t see the quote. He started releasing in 1992 and has had some misses but has been directionally right each time. Best thing about it: It’s simple, elegant and it seems to work pretty well. Doesn’t get much better than that. Worst thing: As 538 points out, Hibbs’s model shows extreme signs of ‘over-fitting’ or describing our specific recent experience instead of the underlying mechanisms. I think Silver is being a little unfair, but the point is well taken. How does it work? : Norpoth’s model counts incumbency and how the two candidates did in the New Hampshire primary: larger percentages of the vote in the Granite State in January correlate with a win in November. Big claim: That New Hampshire matters. My thoughts: History and Primary believes in Obama the most, giving him an 88% chance of a win. Also, oh my lord I hope this logic is wrong. How does it work? : Like the Fair model, this model depends on economic inputs (income and unemployment), but it instead uses them at a state-by-state level to call each state. 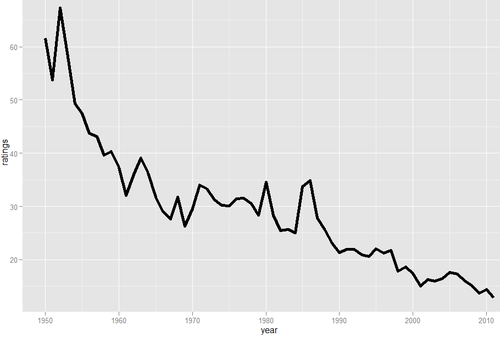 The authors look at previous year vote splits to set a baseline for each state. Best thing about it: The model seems to make sense in theory, and provides specific scenarios. It has Obama losing Ohio and Florida badly- Wisconsin becomes the new swing state due to Paul Ryan’s involvement. Worst thing: This model is conservative, assuming that states lean the way they have in the past. Given that, Bickers and Berry are going to miss any surprises or changes in a state’s electorate. Prediction: Romney and Obama. Wait, what? How does it work? : Not to be outdone, Lewis-Beck and Tien have two separate models that they use, both regression models. The Jobs Model looks at presidential popularity, economic growth, jobs growth, and incumbency, and is what they are better known for. The Proxy Model depends on business sentiment. Right now, the Proxy Model leans towards Obama, while the Jobs Model shows Romney ahead. Big claim: At the point where you feel compelled to build a second model, you probably aren’t claiming crazy results with the first one. Best thing about it: Both are simple models that look to mix sentiment and economic data- the business sentiment report is really a poll in economic data’s clothing. Worst thing: The Jobs Model nailed 2004, but was way off in 2000 and 2008. Maybe it works best when a sitting president is running. My thoughts: Given the poor results in the last few elections, I’m skeptical. The reasoning behind the model makes sense, but I suspect it doesn’t work better than just forecasting using presidential popularity alone. Mudslinging: nobody, really. Even Nate Silver thinks these guys do good work. How does it work? : It uses the index of leading economic indicators (if you aren’t familiar with economics, this is a known index that comes out quarterly), along with the most recent polling data. Big claim: Using data from 1 quarter before the election, the model has gone 13/15 since the 50’s. Also they think that debates don’t make any difference in the election. Best thing about it: You can bring it up to political scientists without getting laughed at. These guys have great reputations. Worst thing: Trying to pronounce Wlezien. Also, since they use quarterly data, they lag behind everyone else on updating: they are still using economic data announced pre-convention. My thoughts: The LEI+P Model likes Obama’s chances, giving him an 80% shot. But this model has over-estimated the incumbent party vote 4 elections in a row (thought within margin of error). That’s probably just coin-flip noise, but it does make me a little hesitant. 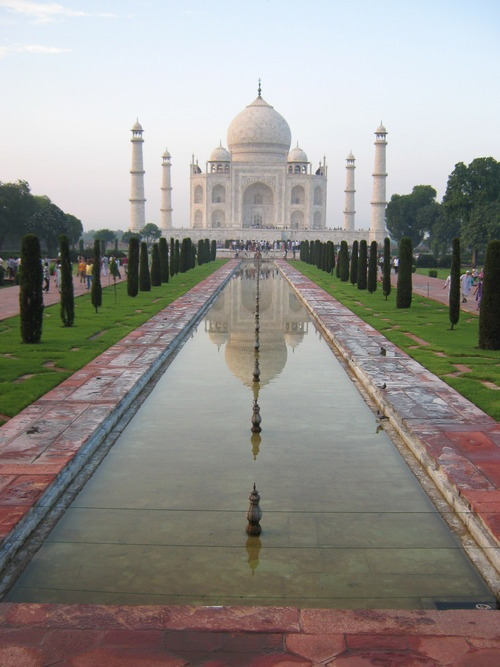 I am recently back from India, and while this is deserving of a much larger post, I thought I’d post some things that were top of mind. I think intellectually everyone realizes that there are a lot of people in India. I mean, duh. But I didn’t appreciate it until I was there. The list of cities by highest density is dominated by India, and if anything this understates the situation: if you restrict it to cities with more than 1 million, six of the top nine are in India. Practically, this means that there are ALWAYS people around outside. Living in NYC, I tell people that every street in the cities is as crowded as 3rd Avenue: not a crush of people like Times Square, but always, always people around. And you can drive 50 miles on a highway and see that kind of density for almost all of it. It is staggering. I went to India expecting pretty-much everyone in a large city to speak Hindi (the national language) and maybe English. I was way off base. Less than a quarter of Indians speak Hindi natively, and only about half really speak it at all. The rest of the country speaks in what I guess you would call ‘regional languages’, but at this scale they aren’t regional. There are more native speakers of Punjabi than German. More of Telegu than French. More of Marathi, Tamil, and Urdu than Italian. Beyond language, the differences between North and South in religion, food, and ethnicity were way beyond what I was expecting. Living in NYC post 9/11 and having been to Israel several times, I am used to fairly tight civilian security. But Pakistan is sponsoring terror attacks in India, and security is really tight as a result. That said, I felt very safe in India (though traveling with family makes it easy). We did drive through a damaged toll gate in Bangalore, however. When I made I comment about it, I was told that an angry mob had broken it in protest of the toll. Not the answer I was expecting. A silly point, but I was surprised. I had never thought about the inside, but you look at it and forget it’s a tomb. There are basically two dead people in there and that’s about it. WYSIWYG, indeed. And yes, I have a ‘Red Red Wine’ Pandora station. what?